From the Riviera to the Rhine details the invasion of France in 1944 from the French Riviera to Strasbourg, using a mixture of media to provide a complete overview of the campaign. Two months after D-Day, just as the battle of Normandy was reaching its climax, with all eyes on the Falaise Pocket, the Allies unleashed the second invasion of France not in the Pas de Calais but the French Riviera. Immaculately planned, effectively undertaken, the Allies quickly broke out of their bridgehead, drove 400 miles into France in three weeks, and liberated 10,000 square miles of French territory while inflicting 143,250 German casualties. On September 10 they linked up with Patton's Third Army and advanced into the Vosges Mountains, taking Strasbourg and holding the area against the Germans' final big attack in the west: Operation Nordwind in January 1945. US Seventh Army and 6th Army Group undertook a successful campaign placing a third Allied army group with its own independent supply lines, in northeastern France at a time when the two northern Allied army groups were stretched to the limit. Without this force the Allies would have struggled to hold the frontage to Switzerland and Third Army would have been exposed to attack in its southern flank—something that could have had disastrous repercussions particularly during the Ardennes offensive of December 1944.The images of palm trees and azure seas obscure our view of this campaign. It was no cakewalk. The Germans knew the Allies were coming and had strong defences in the area. A shortage of landing craft, vehicles, and matériel meant that the US Seventh and French First armies were restricted in the assault. The heavy fog and anti-glider defences made for a difficult airborne assault, but it was carried out effectively, the amphibious assault was textbook in execution and the invasion of southern France ended up as a significant victory. But the story of 6th Army Group wasn't finished. Taking up a position on the east flank of Third Army it fought its way through the Vosges and withstood the Germans' last throw: Operation Nordwind—the vain attempt to relieve pressure on the Ardennes assault by attacking in the Vosges. Heavy fighting pressed hard towards Strasbourg but the Allies were ultimately victorious, inflicting severe losses on the Germans. 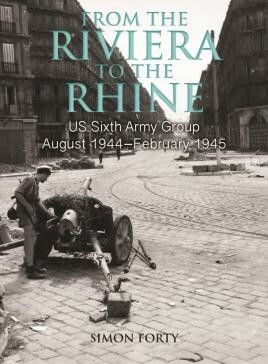 This is an inspiring book for a WWII wargamer, at a very reasonable price (Miniature Wargames). He forgets neither the resistance nor the role of the French troops as can be seen on the cover. As a departure from the usual battles to liberate Europe, this work has few to equal it and tells a chapter of history which deals with a campaign that is rarely ever thought about. A good addition to this series of books from Simon Forty and certainly one I'm happy to recommend.